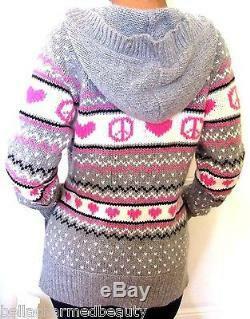 Victoria's Secret Pink Fair Isle Hooded Cardigan. 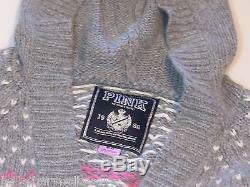 Very RARE Adorable Hoodie by VS PINK. Fair Isle Heart and Peace Sign Pattern. Black, Hot Pink, Gray & White. VERY Hard to Find, don't miss it. Bust 17.5 x Length 26. Measured laying flat, underarm to underarm & shoulder to bottom hem. Attention VeRO members: We are not affiliated or endorsed by the companies mentioned in this listing. All trademarks and copyrights are acknowledged, they are only used as an informative description of the items offered for sale. All items are authentic as evidenced in photos, legally acquired and owned, and hence covered under First Sale Doctrine. Unlawful VeRO removal of this listing will constitute perjury and result in legal action. We strive to provide an online shopping experience that will delight you! From quality products, amazing deals, and outstanding customer service, we hope every aspect of your shopping experience surpasses your expectations. We only sell new, authentic, and fresh items. See our excellent feedback for proof of our thousands of happy customers! We are frequently adding new items to our store, so please follow us and visit often! Thank you again for shopping with us. Our customers and look very forward to seeing you again. We are a smoke-free team & operate in a smoke free environment. Your package will arrive securely and neatly packaged every time! Communicate swiftly usually within 24 hours. Thank you for being a part of our journey, and for all your support, kindness, generosity and love! The item "RARE Victoria's Secret PINK Fair Isle Hooded Cardigan Sweater Hoodie M PERFECT" is in sale since Wednesday, August 03, 2016. This item is in the category "Clothing, Shoes & Accessories\Women's Clothing\Sweats & Hoodies". The seller is "bellacharmedbeauty" and is located in Monroe, New York. This item can be shipped to United States, Canada, Australia, Japan, South Korea, Indonesia, Taiwan, Thailand, Hong Kong, Israel, New Zealand, Philippines, Singapore, Saudi arabia, United arab emirates, Qatar, Kuwait, Bahrain, Malaysia, Antigua and barbuda, Aruba, Belize, Dominica, Grenada, Saint kitts and nevis, Saint lucia, Montserrat, Turks and caicos islands, Barbados, Bangladesh, Bermuda, Brunei darussalam, Bolivia, Ecuador, Egypt, French guiana, Guadeloupe, Jordan, Cambodia, Cayman islands, Sri lanka, Macao, Martinique, Maldives, Nicaragua, Oman, Pakistan, Paraguay, Reunion.